Last Friday, we discussed the importance of internal controls for contractor Work-at-Home (WAH) programs. It is the Government's belief that only a subset of employees can effectively work out of their homes and for those who do work out of their homes, supervision, work assessments, and timekeeping become very important. DCAA (Defense Contract Audit Agency) and other contract auditors routinely conduct floorcheck audits. These unannounced employee interviews are designed to ensure the propriety of labor charges to Government contracts. Typically, the auditor has already made a selection of individuals he/she wants to interview prior to the unannounced visit. What happens when one or more of these individuals are working at home? Finally, the employees employment should be verified to the payroll/personnel records. One question frequently asked by employees contemplating a WAH schedule is the likelihood of a home visit by a Government auditor. That would be weird and extremely unlikely. Nowhere in the audit guidance is there a requirement that the auditor visit the employee at his/her home. Many Government contractors have programs that allow employees to perform their work from home or from an alternative work site. There are advantages to such programs, reduced commuting time, less stress, and for the contractor, reduced overhead (assuming they can jettison some of their facilities). But with these WAH programs, comes a real need for internal controls to determine whether the program is effective. Government auditors are always concerned about potential abuse under WAH programs - many of them do it themselves and so, have first hand knowledge of potential risks, ineffective controls, and abuses. Eligibility and Status - Adequate policies should include a description of the type of work that may be performed at home. For example, work that must be closely supervised, requires access to non-portable equipment or depends on the frequent interaction with others, cannot be performed at home. Policies should also include the status of employees working at home (e.g. full time, part-time, temporary, etc.) and the employees' eligibility for benefits such as insurance and leave. that WAH employees work a mutually agreeable set of core hours to allow management to have access to the WAH employee at designated times. Timekeeping requirements - WAH employees hshould be required to submit timecards in accordance with the company-wide timekeeping system. Contractors without the foregoing minimum controls will undoubtedly be cited for an accounting system deficiency with the potential for billing withholds. The GSA Multiple Award Schedule (MAS) program provides companies the opportunity to sell their products to Government customers. It has been a very successful program for both the Government and companies seeking to sell goods and services. It streamlines the entire procurement process, saving significant resources from the proposal prep and negotiation phases of contracting. Contractors, for their part, must agree to provide the Government the prices afforded their most favored customers, no exceptions. The Department of Justice just announced a $70 million settlement after GSA auditors found that a company failed to disclose "most favored" prices during the negotiation of an MAS contract and as a result, the Government paid more than it should have for the products it purchased. Like many settlements, the contractor did not admit to guilt but, bottom line, it had to pay the Government the $70 million. The $70 million settlement resolved issues discovered during a GSA post-award audit. The audit disclosed that the MAS contractor failed to meet its contractual obligations to provide the GSA with current, complete, and accurate information about its commercial sales practices, including discounts afforded to non-Governmental customers. As a result, Government customers who purchased items under the MAS contract paid higher prices than they should have. Companies pursuing MAS contracts are expected to disclose all sales information to the Government. Omitting sales information because it is considered outdated or not pertinent, opens the door for the Government to later charge defective pricing. It is better to provide the information to the Government during negotiations and then explain it's non-relevance than to withhold it and risk subsequent allegations. You can read DoJ's press release on this settlement here. What are "CD" Contracts and What Are the Risks? Contract Definition (CD) contracts are the kind that are awarded to multiple contractors who will ultimately compete for a major follow-on prime contract. They are usually short-duration contracts. Most of the time they are fixed-price. Upon completion, the procurement activity (contracting officer) will use the results delivered under the CD contracts to help define exactly what it wants in the prime contract. After that determination, it will then issue an informative RFP. Since the contractor's performance on the CD contract will have a direct bearing on its chance of winning the prime, there may be a tendency to spend more than the established contract value. Therefore CD contracts are highly susceptible to labor mischarging and the auditor should evaluate to make sure all allocable effort is being charged. Identify all CD contracts. These contracts are high-risk contracts and, therefore, should be evaluated to make sure all allocable effort is being charged. With these risk factors in mind, the auditors will specifically target any CD contracts to ensure that contractors are not off-loading some of the effort onto other direct or indirect projects/contracts. This is our third and final posting on the 2013 National Defense Authorization Act (NDAA) that was released from conference committee last week. This Act has yet to pass the full House and Senate but from all accounts, it will. Previously we reported on two provisions in the Senate's version that did not make it out of committee, the arbitrary caps on employee compensation and the unlimited access to internal audit reports by Government auditors. One of the provisions that did not make the final cut was to increase the small-business contracting goal from 23 to 25 percent. Section 1631 of the Senate's version included a provision that allowed the President to set small-business contracting goals at whatever he wanted but not less than 25 percent. Every year, it seems, small-business advocates try to increase the statutory goals for awarding contracts and subcontracts to small businesses. And, each year the provisions get pulled. Of course, goals are goals and the real measure of success is ascertaining how well the Government is doing in achieving those goals. So far, the Government has never met the old goal of 23 percent so what is the point in increasing a percentage that cannot be met? OMB (Office of Management and Budget) recently announced an initiative to help Government agencies meet those goals. You can read about that initiative here. Yesterday we wrote about how the conference committee eliminated a provision in the Senate's version of the 2013 National Defense Authorization Act (NDAA) that would limit the reimbursement of compensation paid to contractor employees to that of the US Vice President. Today we want to highlight another change the conference committee made to the NDAA. This one involves access to contractor internal audit reports. Under the Senate's version of the 2013 NDAA, contractors would have been required to grant access to internal audit reports and failure to do so, could render a particular business system deficient and subject the contractor to billing withholds. Under the conference committee's version (expected to pass), the requirement to provide internal audits has been eliminated. Instead, the Act will require that if DCAA needs internal audits, it will request them, document the request, and document the contractors' response to the request. That's it. End of story. If the contractor denies access, there are no ramifications. If the contractor does provide access, the internal audit reports can only be used by DCAA to evaluate the efficacy of contractor internal controls and the reliability of associated contractor business systems. A determination by DCAA that a contractor has a sound system of internal controls shall provide the basis for increased reliance on contractor business systems or a reduced level of testing with regard to specific audits, as appropriate. Internal audit reports provided by a contractor pursuant to this section may be considered in determining whether or not a contractor has a sound system of internal controls, but shall not be the sole basis for such a determination. This also means that the reports cannot be used as a basis for withholding billings. Contractor's can breathe easier, for awhile. They will not be required to turn over internal audits if they so choose. Here's some good news for contractors. The 2013 National Defense Authorization Act (NDAA) emerged from a congressional conference committee on Tuesday missing a few provisions that contractors were opposing including caps on compensation that would limit amounts to the Vice President's salary. In lieu of this provision, the committee recommended further study on the matter. An estimate of the total number of contractor employees whose allowable costs of compensation in each of fiscal years 2010 through 2012 would have exceeded the amount of allowable costs if those costs were capped at the President's and another study if the costs were capped at the Vice President's salary. An estimate of the total number of contractor employees in fiscal year 2012 that could have been characterized as falling within a narrowly targeted exception established by the Secretary of Defense (scientists and computer guys), a description of their duties and services, and their compensation. An assessment of the potential impact on the DoD, contractors of the DoD, and employees of such contractors of reducing the amount of allowable compensation. The GAO report is due within 120 days of enactment of this bill. The GAO (Government Accountability Office) issued a report yesterday to the Senate Committee on Armed Services that looked at DoD's initiative to address the backlog of incurred cost audits and closing out old contracts. The entire report can be found here. significantly reduced the number of low risk audits that will be randomly sampled. The GAO reported that DCAA's new initiative "appears promising" but DCAA has not developed measures by which it will assess whether the initiative reduces the backlog in a manner that protects the taxpayers' interests. Specifically, the GAO found that DCAA does not have a plan for how it will determine whether key features of the initiative, such as the revised risk criteria and the revised sampling percentages, should be adjusted in the future. Already, the number of proposals determined to be high risk is 250% higher than anticipated. That means more audits and more audits is going to jeopardized DCAA's ability to eliminate the incurred cost backlog by 2016. Reducing the backlog of incurred cost audits will ease one obstacle to closing old contracts. The Army recently announced a goal of closing over 475 thousand contracts by September 2014. Unless it can quick-close some of those, it will need DCAA's audits to achieve that goal. The GAO report was somewhat critical of the Navy and Air Force for not establishing similar goals. This is an edited version of a post from 2010 but we are posting it again because of a recent situation where a company, in the process of purchasing a Government contractor, had to scale back its offer when it determined that the fair market value of the assets could not be depreciated under Government contracts. When a contractor becomes aware that a change in its ownership has occurred (or is certain to occur) that could result in changes in the valuation of its capitalized assets in the accounting records, it must notify the ACO (Administrative Contracting Officer) within 30 days. Additionally, the contractor must notify the ACO within 30 days whenever changes to asset valuations or any other cost changes have occurred or are certain to occur as a result of a change in ownership. This requirement applies to negotiated contracts or for which any preward or postaward cost determinations will be subject to the FAR cost principles in Part 31 (see FAR 15.408(k)). To find out whether it applies to your contract(s), look for the contract clause 52.215-19. Obviously, the Government does not want to pay for assets again and again. Some business combinations result in assets being "written up" to their fair market value (purchase method, for example) and there have been cases (prior to the implementation of FAR 31.205-52) where the Government paid for assets again after it had paid for the assets, through depreciation, to the predecessor company. This requirement also applies to negotiated subcontracts.. Finally, we bring to a close our series on compensation costs. The FAR (Federal Acquisition Regulation) cost principle governing compensation is by far the longest and most complex of all the cost principles. Compensation costs often represent the most significant cost element in contract pricing and incurred costs. As far as the Government is concerned, compensation represents one of, if not the area of greatest risk. An Employee Stock Ownership Plan (ESOP) is a stock bonus plan designed to invest primarily in the stock of the employer corporation. The contractor's contribution to an ESOP is made with cash, stock, or other property. It is difficult to find someone in the acquisition field that is familiar with ESOPs. Most auditors and contract administrators will spend an entire career without ever having to learn about ESOPs much less having to make recommendations or decisions. As a general rule, the costs of ESOPs are allowable but there are a few conditions. Some ESOPs meet the definition of a pension plan. Costs of those ESOPs must comply with CAS 412 (compensation and measurement of pension costs). ESOPs that are not pensions, must comply with CAS 415 (deferred compensation). Additionally, contributions in any one year that exceed the deductibility limits of the IRS Code are unallowable. When ESOP contributions are made with company stock, the value of the stock is limited to the fair market value of the stock on the date that title is effectively transferred to the trust. When the contribution is in the form of cash, stock purchases by the trust in excess of the fair market value are unallowable. Determining fair market value of publicly traded companies is easy. However, in the case of a closely held corporation, the fair market value is not readily determinable so this regulation requires that the valuation be made on a case-by-case basis taking into consideration the guidelines for valuation used by the IRS. As many closely-held companies know, valuation is more art than science and the true value of a company is the price that a willing buyer and seller agree upon. Closely held companies that produce a valuation to support ESOP contributions can expect close scrutiny by the Government. This section of the FAR cost principle on compensation addresses statutory limitations on the overall compensation for certain contractor personnel. These compensation caps have been around since 1995. 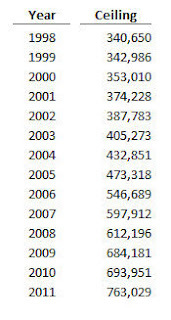 Initially, they applied to DoD contracts only but starting in 1998, the caps were extended to all Government contracts. In 1995, the compensation cap was $250 thousand. 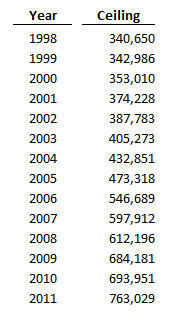 By 2011, the cap had risen to $763,029. The most recent cap (i.e. $763 thousand for 2011) stays in effect until revised by the Office of Management and Budget (OMB). They cannot be escalated for future years. Compensation, as defined under this cap includes only wages, salaries, bonuses, deferred compensation and employer contributions to a defined contribution pension plan. It does not include other elements of compensation such as severance pay, early retirement incentive pay, etc. Since 1999, the cap applies to the five most highly compensated employees in management positions at each home office and each segment of the contractor, whether or not the home office or segment reports directly to the contractor's headquarters. Beginning in 2012, the cap was extended to all employees under DoD, NASA, and Coast Guard contracts (see Section 803 of the 2012 NDAA). Have you ever wondered why it takes such a long time for DCAA (Defense Contract Audit Agency) to issue an audit report? If you've had recent experience with DCAA, you probably have wondered. There are multiple factors but one of the biggest factors is the inscrutable review process. Before an audit begins, the auditor must hold a planning meeting with his/her supervisor, office manager, and regional audit manager to discuss the risk of fraud and noncompliances with applicable laws and regulations that could have a material effect on whatever system is being audited. They discuss prior audit experience, the contractor's environment, and more. Sometimes, you just have to pity the poor auditor. The Service Contract Act of 1965 was enacted to ensure that Government contractors compensate their blue-collar service workers and some white-collar service workers fairly, but it does not cover bona fide executive, administrative, or professional employees. That omission is covered in FAR 22.1103. The Government is concerned with the quality and stability of the work force to be employed on its service contracts. Professional compensation that is unrealistically low or not in reasonable relationship to the various job categories may impair a contractor's ability to attract and retain conpetent professional service employees. Recompetition of service contracts may in some cases result in lowering the compensation (salaries and fringe benefits) paid or furnished professional employees. This lowering can be detrimental in obtaining the quality of professional services needed for adequate contract performance. Therefore, it is in the Government's best interest that professorial employees be properly and fairly compensated. FAR 22.1103 requires that solicitations for negotiated service contracts, when the anticipated contract amount is greater than $650 thousand, and the service to be provided will require meaningful numbers of professional employees, include a requirement to submit, for evaluation a total compensation plan setting forth proposed salaries and fringe benefits for professional employees working on the contract. Supporting information is also required and should include data such as recognized national and regional compensation surveys and studies of professional, public and private organizations, used in establishing the total compensation structure. FAR 52.222-46 cautions that "low-balling" may be viewed as evidence of failure to comprehend the complexity of the contract requirements and failure to provide a compensation plan may constitute sufficient cause to justify rejection of a proposal. Last month, the Government intervened in a lawsuit against Fluor Hanford Inc. and its parent company, Fluor Corporation (collectively Fluor). The False Claims Act lawsuit was originally filed by a whistleblower who was also a former employee of Fluor. Between 1999 and 2008, Fluor had a prime contract with the Department of Energy (DOE) to provide a wide variety of security, maintenance and operational services at the DOE’s Hanford Nuclear Site in southeastern Washington State. As part of its contract, Fluor was responsible for managing and operating a federally-funded facility to train Hanford site workers as well as first responders and law enforcement personnel. The whistleblower complaint alleges that, as a condition of receiving its DOE contract, Fluor was required to certify that it would not use federal funds for lobbying activities. The complaint further alleges that between 2005 and 2008, Fluor ignored these restrictions and used DOE funding to lobby Congress and executive branch officials for more funding for the training facility. The complaint alleges that Fluor, and two lobbying firms hired by Fluor and paid using DOE funds, Secure Horizons LLC and Congressional Strategies LLC, lobbied members of Congress and executive branch agencies to include additional funds for the training facility in agency appropriations. The United States intervened in the lawsuit. At contractor locations with a significant amount of planned audit activity, the Defense Contract Audit Agency (DCAA) conducts what they term, "Annual Audit Planning and Requirements Planning Meetings" with contractor representatives and contracting officers. These meetings are typically held during the first quarter of the Government fiscal year (i.e. October -December time frame). At these meetings, the auditors present the various types of audits they plan to conduct in the current year. Applicable audit guidance also instructs them to solicit contractor and contracting officer input into the planned audit schedule. Regardless of the meetings' ostensible purpose to solicit input from contractors and contracting officers, by the time the meeting rolls around, the audit plan for the year is very much fixed.. We know of no situation where the audit plan was changed as a result of input from either the contractor or the contracting officer. Even though contractors have no real input into the annual audit plan, these meetings are informative for learning what the auditor(s) plan to do during the year. It is especially important to know which internal control systems will be audited, which CAS standards will be reviewed for compliance, and which contracts have been selected for defective pricing audits (compliance with TINA, or the Truth in Negotiating Act). Knowing this information will help contractors prepare for the audit and compile information and data that is likely to be required/requested. Many times, contractors sit passively through these meetings, taking a few notes, and nodding once in awhile. We think it is much better to use this time to engage the auditor. Once the audits begin, auditors are not likely to be very conversant. Now is the time to ask them why they chose to schedule a particular internal control audit, how they view the existing system, what were the results of audit the last time they audited and whether there are any risk indicators currently. When the discussion turns to defective pricing, be sure to ask them your PASS rating and the objective and subjective elements that made up the rating. Challenge the auditors to explain why particular CAS standards are applicable or not applicable. Sometimes the auditors want to "call it in" rather than face to face. We don't believe that annual planning meetings make efficient conference calls - its too difficult to have meaningful communications. Have the auditors come out and make their presentations. The Office of Federal Procurement Policy (OFPP), part of the Office of Management and Budget (OMB) announced yesterday that contract spending in fiscal year 2012 fell by $20 billion compared to fiscal year 2011. According to OFPP, seven of the $20 billion came from reductions in management support services such as information technology systems, development, program management and engineering. Savings were also achieved by agencies pooling their purchases to get the same goods and services at lower prices. The administration is proud of its accomplishments and last Wednesday, announced a new series of initiatives to continue the trend. The focus of the new initiatives is to drive even better coordination of contracting to achieve more savings in buying computers, IT software, janitorial and sanitation supplies, office furniture, building maintenance and operations services, and other professional technical services. As almost an afterthought, the new initiatives add "To the maximum extent practicable, all strategic sourcing opportunities shall seek to increase participation by small businesses". Yesterday, we informed you that the Senate unanimously (98-0) passed the fiscal year 2013 National Defense Authorization Act that included caps on employee compensation. That same bill included a provision that will require defense contractors to provide not only their internal audit reports but also the supporting working papers to Government auditors. assess the amount of risk and level of testing required in connection with specific audits to be conducted by the Agency. Contractors who fail to provide access, risk having one or more of their business systems determined to be inadequate (or disapproved) and would result in billing withholds. Last August, we wrote a three-part series on internal audits and their value in reducing the amount of audit testing by DCAA (hint: not much). You can read those postings here: Part I, Part II, and Part III. But, the GAO thinks it is important and DCAA cited the general lack of access as one of the issues causing inefficiencies in its audits. The Senate bill must be reconciled with the House version. It is unknown whether this provision will survive the conference committee. Yesterday evening, the Senate unanimously approved the Fiscal Year 2013 National Defense Authorization Act (NDAA) that includes a provision capping compensation of any contractor employee at $230,000 per year. It will become effective on January 1, 2013 and applies to all contracts including those entered into before, on, or after that date. The House version of the NDAA does not contain the provision. The question now is whether the Conference Committee will leave it in or take it out? Stay tuned. With all the discussion about sequestration and fiscal cliffs, contractors with DoD contracts might want to check their contracts for the existence of DFARS clause 252.37-7023. DoD Contracting Officers are required to use this clause in solicitations and contracts having essential contractor services. The clause requires the appropriate functional commander or equivalent to specifically identify which functions of a contract are mission essential services. A contractor who provides Government-determined essential contractor services shall have a written plan to ensure the continuation of these services in crisis situations. “Essential contractor service” means a service provided by a firm or individual under contract to DoD to support mission essential functions, such as support of vital systems, including ships owned, leased, or operated in support of military missions or roles at sea, and associated support activities, including installation, garrison, and base support services. Services are essential if the effectiveness of defense systems or operations may be seriously impaired by the interruption of these services during periods of crisis caused by the changing threat environment, hurricanes, tornados, earthquakes, blizzards, floods, or pandemic influenza, etc. “Mission-essential functions” means those organizational activities that must be performed under all circumstances to achieve DoD component missions or responsibilities, the failure of which would significantly affect DoD's ability to provide vital services or exercise authority, direction, and control. When the clause for continuing performance of essential services is incorporated into a contract, the cost of preparing the plan and costs to keep the plan in place, such as potential retainer fees with other service providers and costs related to contracting officer directed training activities associated with testing the effectiveness of the plan, would be valid contract costs subject to the allowability, reason­ableness, and allocability provisions of FAR 31.201 and the cost principles at FAR 31.205. Since most plans for continuation of essential services will be specific to the contract and contractor, auditors are being instructed to carefully examine the validity of these costs on a case-by-case basis. Most contractors normally allocate the costs of planning for continuing operation of the overall organization as an indirect cost. However, contractors should generally charge planning costs for contractually required continuation of essential contractor services as direct costs. While CAS 402, Consistency in Allocating Costs Incurred for the Same Purpose, requires that each type of cost is allocated only once and on only one basis to any contract, the illustrations at CAS 402-60(b) support that planning for the continuing operations of the overall organization are not incurred for the same purpose in like circumstances as the planning for continuing essential contractor services as required by the contract. Plan Execution Costs. The contractor is required to segregate and separately identify all costs incurred in continuing performance of essential services in a crisis situation. A contractor has 90 days (longer if approved by the contracting officer) to notify the con­tracting officer of an increase or decrease in costs after he or she has directed continued performance. The parties shall negotiate an equitable adjustment to the contract price as soon as practicable after receipt of the contractor’s proposal. As DFARS 252.237-7023 provides for an equitable adjustment, costs to execute the plan should not be included in price proposals. Auditors are being instructed to question any plan execution costs included in price proposals. A little more than two years ago (September 2010), the Department of Defense raised the threshold for price proposals requiring audit to $10 million for fixed priced contracts and $100 million for cost-type contracts. Last month, the DoD Inspector General's Office (DoD-IG) issued a scathing report on that decision stating that the Department had not performed a business case analysis to support it. That decision, according to the DoD-IG will cost taxpayers $249 million per year in lost return on investment from DCAA contract audits. The audits under the DCAA threshold were given to DCMA (Defense Contract Management Agency) but according to the DoD-IG, DCMA is not prepared to perform contract cost analaysis in place of DCAA and that DCMA cannot reliably report performance. Furthermore, the Department of Defense has no idea whether DCMA has even a remote chance of replicating the $249 million that DCAA could have achieved had the audit thresholds remained at their pre-September 2010 levels. Finally, the DoD-IG found that the Department did not demonstrate why they chose to direct taxpayer resources to DCMA to perform a job that it was not prepared to perform when DCAA had existing infrastructure in place to get the job done. Perhaps the Department of Defense did not perform a business case analysis for shifting work from DCAA to DCMA but the fact is, DCAA was not getting the job done and their failure was significantly delaying the awards of contracts. The decision was borne more out of frustration than anything else. The DoD-IG made a number of recommendations including a return to the old audit thresholds. You can read the entire report here. Backpay is a retroactive adjustment of prior years' salaries or wages. Backpay should not be confused with deferred compensation. While backpay is generally unallowable, deferred compensation is usually allowable if a deferred compensation plan is set up correctly. This provision changed significantly in 2003. Prior to that, backpay included settlements for violations of Federal labor laws and the Civil Rights Act of 1984 (e.g. improper discharge or discrimination). Under the 2003 revision, backpay is defined as additional compensation for work performed. According to FAR 31.205-6. (h), backpay is unallowable except for a few situations. Payments to employees resulting from underpaid work actually performed are allowable, if required by a negotiated settlement order, or court decree. Contractor intending to claim backpay under this provision will most likely need legal assistance. Payments to union employees for the difference in their past and current wage rates for working without a contract or labor agreement during labor management negotiation are allowable. An established policy or practice exists and is followed by the contractor so so consistently as to imply, in effect, an agreement to make such payments. This rule effectively takes away situations where if a survey shows an employee is underpaid in a particular year, the contractor could make that underpayment up in a future year. The allocation of backpay costs can be tricky. Usually settlements occur several years after the period to which backpay is allocable. If you have a backpay situation, we advise that you pursue an advance agreement (see FAR 31.109) with the contracting officer. Otherwise, you are risking time-consuming arguments with the auditors. Circumstances of the particular employment. These are pretty broad categories and we do not recall when a contractor's intention to pay or actual payment of severance pay was successfully challenged by the Government for failing to meet one of these four conditions. Back in the 1970s and perhaps the early 1980s, as service contracts changed hands, winning contractors would hire the employees of the incumbent contractor and those employees would continue to do the same work that they had been performing. Sometimes, hiring incumbent employees was a requirement of the solicitation and other times, it was convenient and made business sense. However, upon losing the contract, incumbent contractors were paying their employees a severance pay and seeking reimbursement for those costs from the Government. That precipitated a new rule where payments made in the event of employment with a replacement contractor where continuity of employment with credit for prior length of services is preserved under substantially equal conditions of employment or continued employment by the contractor at another facility, subsidiary, affiliate, or parent company of the contractor are not severance pay and are unallowable. There are two kinds of severance pay addressed in this cost principle; normal severance pay and abnormal severance pay. allocated to all work performed in the contractor's plant. Abnormal or mass severance pay is of such a conjectural nature that accruals for this purpose are not allowable. However, the Government recognizes its obligation to participate, to the extent of its fair share, in any specific payment. Thus, the Government will consider allowability on a case-by-case basis. Specific requirements for foreign national employees. The costs of severance payments to foreign nationals employed under a service contract performed outside the US are unallowable to the extent that such payments exceed amounts typically paid to employees providing similar services in the same industry in the US. Further, all such costs of severance payments that are otherwise allowable are unallowable if the termination of employment of the foreign national is the result of the closing of, or the curtailment of activities at a US facility in that country at the request of the government of that country. This does not apply if the closing of a facility or curtailment of activities is made pursuant to a status-of-forces or other country-to-country agreement entered into with he government of that country before November 29, 1989. Applicable statutes permit the head of the agency to waive these cost allowability limitations under certain circumstances. In November 2008, FAR was amended to require mandatory disclosure requirements involving fraud and overpayments on contractors (and subcontractors). These disclosure requirements apply to contracts greater than $5 million and a performance period greater than 120 days. This disclosure requirement applies to most types of contracts including commercial items and contracts awarded and/or performed overseas. FAR 52.203-13 requires timely disclosure of violations against criminal and civil laws. Criminal laws include fraud, conflict of interest, bribery, or gratuity violations. Civil laws include the False Claims Act. There must be credible evidence of a violation and the violation must have been committed by any contractor principal, employee, agent, or subcontractor. Disclosures must be made in writing to the appropriate Inspector General (e.g. the DoD Inspector General for DoD Contracts) and the contracting officer. The reporting period extends from contract award to three-years after final payment. Many contractors do not realize that the reporting period extends beyond the contract period of performance. The term "credible evidence" is undefined. but the FAR Councils have noted that the term indicates a higher standard than "reasonable grounds to believe". Implicit in this distinction is an allowance of time for a contractor to investigate matters to make a "credible evidence" determination. Failure to disclose credible evidence of criminal and civil violations (and significant overpayments) constitute grounds for suspension and debarment. Sleeter Group Announces 2013 "Awesome Applications"
Each year since 2006, the Sleeter Group has culled through dozens of QuickBooks add-ons to select a few that rise above the others. They awarded these applications their "Awesome Add-on Award". This year, the Sleeter Group changed its format to include non-specific QuickBooks products and renamed their promotion from "Awesome Add-ons" to "Awesome Applications. While some QuickBooks specific add-ons made the winner's circle, many of the applications are stand-alone, not requiring QuickBooks to function. As consultants with many clients using QuickBooks, we are always interested in any improvements to the basic platform as well as improved or added functionality provided by third-party add-ons. With hundreds of add-ons available however, it is difficult to assess which ones are worthwhile and which should be avoided. Having reviews by an independent (and reputable) organization certainly helps in assessing a product's strengths weaknesses, and value. Click here to read about the winners of the 2013 Awesome Applications. Go here to read about previous winners. Of the nine winners, the following three have the most potential for benefiting Government contractors and prospective contractors. BillQuick by BQE Software. This is a repeat winner. BillQuick is an integrated solution for time & expense tracking, billing and project management. Many Government contractors use this product. Cloud9 Real Time by Cloud9 Real Time. This application hosts all of your applications, data, and users in one central location, in the "cloud". Concur Small Business Edition by Concur. This is an office expense management and reporting application. Contractors who perform a lot of travel and have inefficiencies in collecting travel expense information might benefit from Concur SBE. eFAACT, a QuickBooks solution for Government contractors was a finalist in this year's selection process. If you are looking for something to facilitate indirect rate development and billings under Government contracts, you might want to evaluate this product. Our impression? Powerful but expensive. FAR 16.301-3 states that a cost-reimbursement type contract may be used only when the contractor’s accounting system is adequate for determining costs applicable to the contract. Contracting officers must make this determination prior to the award of a contract. If the contracting officer has insufficient information to make this determination, it will request DCAA or another audit organization to perform a Preaward Survey of Prospective Contractor’s Accounting System (SF Form 1408). DCAA has been instructing contracting officers to send out a preaward survey checklist to prospective contractors to complete prior to requesting a preaward survey of the accounting system. This checklist will help ensure that the contractors understand the requirements of the SF Form 1408 and to ensure that they are ready for DCAA to come in a perform an audit. Are you planning on bidding on cost type contracts? Are you ready for a DCAA audit? Have you read the requirements in the SF Form 1408? Have you read the "Information for Contractors" pamphlet? Please identify the DCAA office cognizant of your company. Please identify your company's point of contact. If an outside CPA/Consultant/Non DoD agency has reviewed your Accounting System, please provide a copy of the report. This last bullet requires some clarification. The "review" that is referred to here is an attestation engagement performed in accordance with Generally Accepted Government Auditing Standards (GAGAS) a.k.a. a "Yellow Book" audit. It would not include the results of, say, an outside firm (like PNWC) performing a review to identify potential weaknesses in a contractor's accounting system and making recommendations, as appropriate, on improving the system to meet Government contracting requirements. Those are not "reviews" conducted in accordance with GAGAS. Companies looking to enter the Government contracting arena or existing contractors looking to bid on cost-reimbursable contracts, will find this checklist useful.